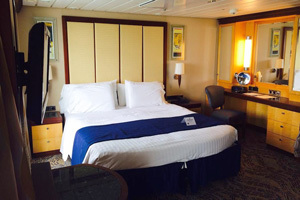 What cabin should I book on Royal Caribbean’s Navigator of the Seas? What You Get: Cabins in the lowest category are 150 square feet, but a curtained-off sitting area makes them feel a little more spacious. What You Get: In lieu of actual ocean vistas, an 80-inch-high, floor-to-ceiling high-definition screen displays real time views of the scenery outside. 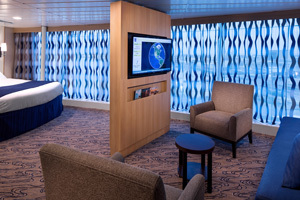 Eighty-one interior staterooms on Navigator of the Seas were upgraded with virtual balconies as a sneak peek for Quantum of the Seas, which has a virtual balcony in every interior room. While this is a neat new feature and a great way to make an otherwise basic interior room more fun, you could potentially spend at least $350 less for a real balcony with real views. What You Get: These interior rooms are only a mere 10 square feet larger than regular interiors, but they have bay windows overlooking the Royal Promenade. You can watch the street parties and parades below from the comfort of your window seat. One caveat: The parades can march past midnight, and although the noise sounds muffled from inside the cabin, it might disturb those wanting to turn in early. What You Get: The only major difference between this category and the interior category is the large circular window looking out onto the water. These cabins are normally 160 square feet, but on Deck 3, you can get 180 square feet for the same price. 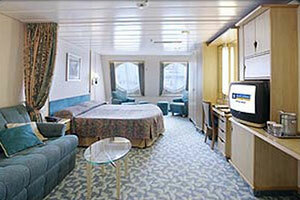 What You Get: The word “large” is a bit misleading, considering these staterooms are just 175 square feet. They are, however, only found in the aft or bow on Decks 6, 7, 8, and 9. What You Get: Located on Deck 12 at the bow, these new staterooms surround the Vitality at Sea Spa and Fitness Center, allowing for quick access to a morning workout. The floor-to-ceiling wraparound window takes up one full wall, offering unobstructed ocean views and lots of natural light. 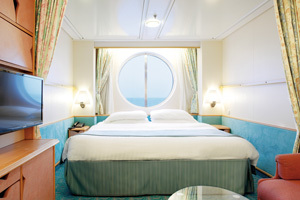 What You Get: There are just two of these 283-square-foot rooms onboard. In addition to more square footage and floor-to-ceiling windows, each of these rooms also comes with a double sofa bed. What You Get: These rooms can sleep up to six in a combination of arrangements that include two twin beds that can be combined into a royal king (which is actually a European-style king closer to the size of a U.S. queen), a double sofa bed, and two stacked bunk beds in a separate area just beyond a curtain. The coolest part about these cabins is their forward center location — the placement of the large round windows makes you feel like you’re in the captain’s seat as you glide through the water. 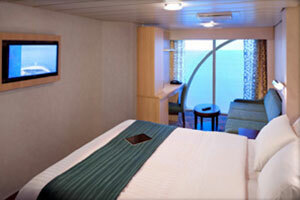 What You Get: There are just two cabins in this new category, both wedged between Panoramic Ocean View rooms. But these family-style versions are twice the size to accommodate up to six, and their location is so desirable at the center bow on Deck 12 that the price jumps significantly. What You Get: These cabins are about the same size as the Large Ocean View rooms but include a balcony with two chairs and a small table. 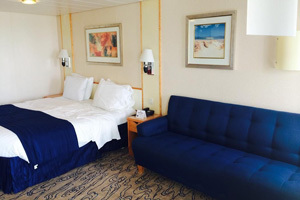 This can be a good choice if you’re traveling with family or friends — for much more space, you can book two connecting rooms midship, or if you don’t mind sharing one room, ask for one with a Pullman bed, but be prepared to pay extra for it. 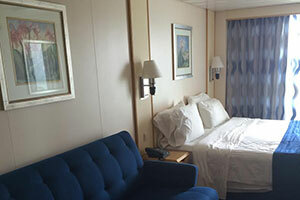 What You Get: This is essentially a deluxe ocean view stateroom with balcony with a few extra square feet in both the living area and the balcony. Although you don’t get any more closet space than you do in the deluxe (there’s plenty of room for two people to store their items), it’s worth the small upgrade fee for just a little more room to move around, especially for groups of three or four. 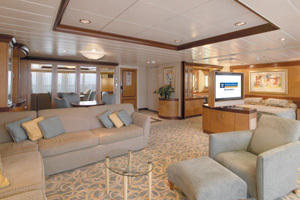 What You Get: Although dubbed “suites,” these rooms come with the same amenities as interior, balcony, and inside staterooms, with the addition of a bathtub. 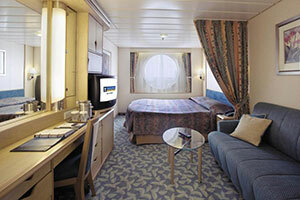 They typically sleep two, but 10 aft-facing cabins can accommodate three or four with double sofa beds. Be wary of those, though, as nearly all of the aft-facing junior suites have obstructed views, which may disappoint if you’re into watching the scenery from your balcony. 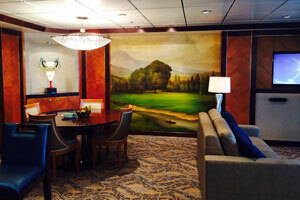 What You Get: When you enter one of this ship’s suites — excluding the junior suite — you can see what your extra money to upgrade was spent on. The oversized headboard and mosaic tile work in the bathroom are some of the design details that make the room feel less like a cabin and more like a luxury hotel room. You’ll find a lot of storage space behind the large wooden closet doors — which comes in handy when a group of four is staying here. The balcony runs the length of the suite and has two wicker chairs and a round table. 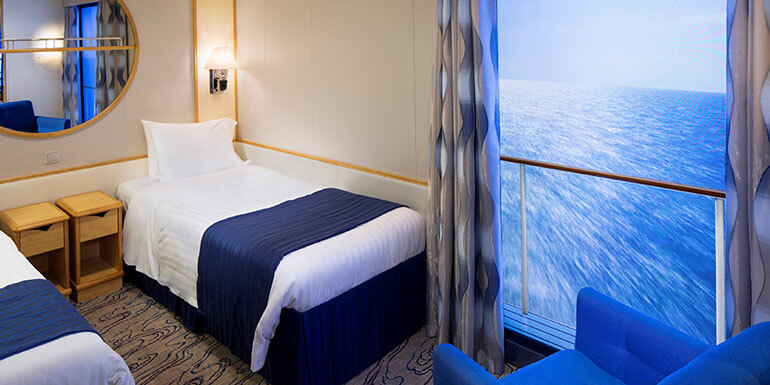 If a view off the bow isn’t necessary to you, this is a great option: It’s the same price as the family panoramic ocean view stateroom, and you get a balcony. 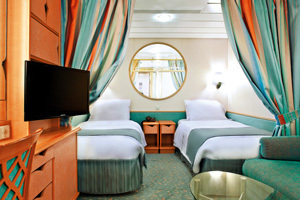 What You Get: These four aft-facing suites are on Decks 8 and 9. They each have two bedrooms and two bathrooms (one with a shower and one with a bathtub), along with third and fourth Pullman beds in one of the rooms. The sofa even pulls out to a double bed, so you could potentially have a group of eight in this 574-square-foot cabin. If you start to feel claustrophobic, head out to the balcony, which is larger than an entire interior cabin. What You Get: The spacious living room with a sectional couch and bar area is perfect for hosting a cocktail party. A 42-inch flat-screen TV swivels to face the sofa (containing a queen-size pullout) or the queen-size bed and creates a division between the sleeping and sitting areas. The bathroom features both a tub and a separate shower. The balcony has the standard wicker chairs and round table, plus a lounge chair to relax in. What You Get: You may forget you’re even on a cruise ship when you walk through the double doors of this 1,336-square-foot suite. Past the dramatic marble columns is a huge living and dining area with a bar and a baby grand piano sitting under a chandelier. (While the piano does add an opulent air to the room, unless you play, it fees like an impractical use of the space.) Beyond two more columns is the door to the balcony, which runs the length of the suite and has multiple lounge chairs. The bedroom gets lots of natural light from a wall of windows, and the walk-through closet leads to the bathroom with a whirlpool tub, separate shower, double sinks, lots of counter space, and a cushioned bench seat. There’s also a second bathroom with a stand-up shower. 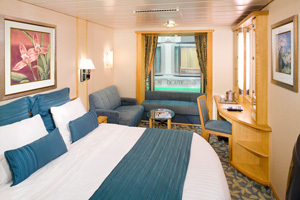 Located midship on Deck 10, this is the only cabin of its kind onboard, so book early if you’re going to treat yourself. 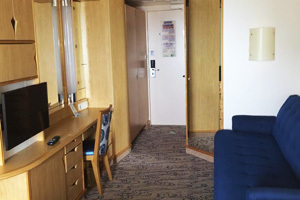 All cabins within Royal Caribbean Cruise Lines’ Voyager class (Navigator of the Seas, Adventure of the Seas, Voyager of the Seas, Explorer of the Seas, and Mariner of the Seas) come with a minifridge/bar stocked with snacks and soda (no alcohol! ), large vanity with a chair — surrounded by several cabinets and drawers, and 110/220 outlets close by — a lightweight hair dryer connected inside the top drawer of the vanity, small closet, separate sitting area, direct-dial phone, flat-screen TV, two twin mattresses that can be converted to a “royal” king, nightstand with extra lighting above, stand-up shower, generic bar soap, body wash and shampoo dispensers inside the shower, and small code-locked safes. In the grand suites and above, you also get a private balcony, a complimentary bottle of Champagne, coffee maker and teakettle with coffee “bags,” tea bags, and sweetener, Gilchrist & Soames® bath products, and access to a concierge service and private lounge. 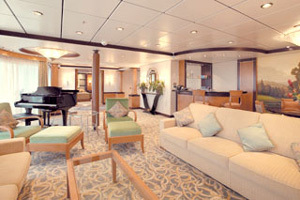 Because there are so few suites onboard, they tend to fill up as far as a year in advance. 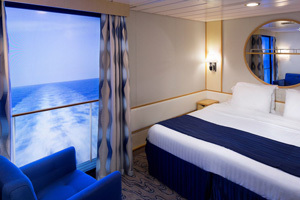 How important is having a balcony in your stateroom?